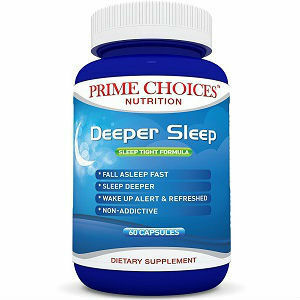 Prime Choices Nutrition Deeper Sleep is a supplement is designed to help normalize sleep patterns, and to encourage better, deeper sleep without any addictive substances or associated drowsiness upon waking. Vitamin B6 has been shown to convert naturally-occurring tryptophan present in the body into niacin and serotonin. Serotonin is a primary neurotransmitter that regulates sleep patterns and induces a feeling of well-being and calm. The company recommends taking one or two capsules at bedtime. This supplement should not be given to children, and should not be taken by women who are pregnant or breastfeeding. Individuals who have suffered from depression, have an autoimmune, or other chronic illness should consult a doctor before taking this product. Some of the ingredients may cause headaches or slight upset stomach in rare cases. The gelatin capsule makes this unsuitable for vegans and vegetarians, and may be unsuitable for individuals who are kosher or halal. A bottle of 60 capsules of Natural Deep Sleep on Amazon usually retails for around $24. At the time of writing it was out of stock. The company offers a 100%, no questions asked guarantee if you are unsatisfied with your purchase. Reviews seem to indicate that the product works best when taken during times of particular stress or exhaustion, rather than as a daily part of a bedtime routine. The ingredients are high quality and effective at encouraging relaxation and sleep, but the gelatin capsule makes this supplement unsuitable for vegetarians, vegans, and possible those who are kosher. The lack of availability is the most clear negative, especially as it is uncertain when or if the supplement will be restocked. For those who suffer chronic sleeplessness this supplement may not be the best solution, as users reported becoming habituated to the ingredients after a few weeks of use. Click here to learn about our Top Insomnia Treatment Products. Bernard Spradlin	reviewed Prime Choices Nutrition Deeper Sleep	on December 13th	 and gave it a rating of 3.